Tired of Polishing Your Silver? Polishing silver is time consuming, messy, and just not a lot of fun. Here’s a few tricks you can use to minimize or slow down the process. • Have a few pieces of chalk laying out wherever you store your silver. Whether it’s jewelry, flatware, or some other silver trinkets you might have, the chalk will absorb moisture which often causes silver to tarnish. • Wrap silver pieces in tissue paper. This is good for your larger items that you only use on special occasions. • Put small packets of silica gel in your jewelry box or flatware drawer. Often these packets can be found inside new shoes. You can also purchase Hydrosorbent Silica Gel from Cabelas. • Make a sachet containing activated charcoal (available from pet stores). The charcoal acts as an “air scrubber” removing the sulphur from the air which will slow the tarnishing process. Place the sachet wherever you store your silver. 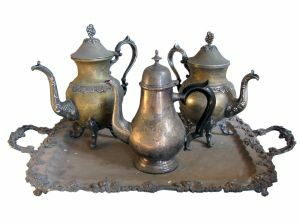 This entry was posted in Antique Tips, Silver by fkantiques. Bookmark the permalink.